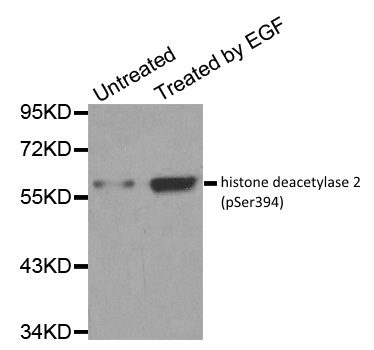 Rabbit anti Histone deacetylase 2 (pSer394) antibody recognizes histone deacetylase 2, also known as HDAC2, when phosphorylated at serine 394. Histone deacetylase 2 is a class 1 histone deacetylase. Histone deacetylases are chromatin-modifying enzymes that are involved in regulation of many aspects of cell biology including tissue differentiation, autophagy, apoptosis, migration, mitosis and angiogenesis. Phosphorylation at serine 394 is involved in the regulation of the enzymatic activity of histone deacetylase 2 (Tsai and Seto 2002). 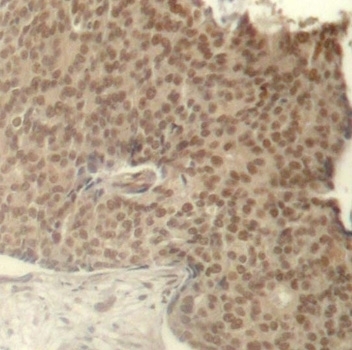 Antiserum to histone deacetylase 2 (pSer394) was raised by repeated immunization of rabbits with highly purified antigen. Purified IgG was prepared from whole serum by affinity chromatography. Tsai, S.C. & Seto, E. (2002) Regulation of histone deacetylase 2 by protein kinase CK2. J Biol Chem. 277 (35): 31826-33.